*Works with all IDEs in which you can paste text using CTRL+V keyboard combination. CodeDemo pastes code snippets into your favorite IDE without getting in your way. CodeDemo is for instructors, presenters and speakers who create instructional demos, record screen-casts or do live presentations. Runs on Windows® 7/8+ with .NET® Framework 4.0 or higher. 30-Day Money Back Guarantee. If you are not completely satisfied with CodeDemo, we will refund your money. Support will be provided via email only. Expect 24-48 hour turn-around for replies to any support queries. CodeDemo is provided on AS-IS basis without any warranties. Read CodeDemo license here : CodeDemo EULA. CodeDemo works by monitoring all keystrokes, while it is running, by hooking into Windows® message pump using Windows® API. When you type the Id of the snippet you want to paste followed by the TAB key, CodeDemo replaces the id you just typed by the corresponding snippet. Collect your snippets in a text file. Make sure the snippets are separated from each other by 3 or more blank lines. Open this text file in CodeDemo. In your IDE, type the id of the snippet followed by TAB key. You don't use Visual Studio? No problem. CodeDemo works with practically all IDEs: Visual Studio, Eclipse, Sql Server Management Studio, Powershell Script Editor, WebStorm and many more. It even works with browser based/cloud IDEs like Cloud9 and CodeRun. *It works with any IDE in which you can paste text using CTRL+V keyboard combination. No more switching back and forth between notepad and your IDE to cut and paste snippets while doing your presentation. With CodeDemo, you are free to focus on your presentation in your IDE instead of worrying about copying and pasting code snippets. CodeDemo will quietly paste your snippet at your current cursor position on your command. Tired of exporting/importing code snippets in Visual Studio? CodeDemo will make your snippets available in any IDE, including Visual Studio, without making any changes to your IDE. Using AutoHotKey requires you to wrap each step of your demo in a script. In CodeDemo, your snippets are in a plain text file with nothing but your content in it. It does not get any easier to maintain the code snippets for your demos. Losing your place in the presentation with all that ALT-TAB, CTRL+C and CTRL+V? CodeDemo will keep your place in your presentation and guide you to your next step without getting in your way. You will not believe how simple it is to use CodeDemo! 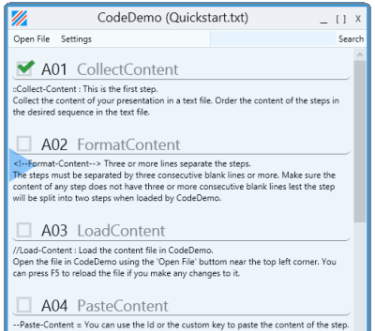 A handy Quickstart guide is loaded for you when you first start CodeDemo. Just read the short instructions and you will be using CodeDemo in no time. Your demo spans multiple IDEs? No problem. CodeDemo works across IDEs. You can paste one step in Visual Studio and the next one in Sql Server Management Studio and so on. CodeDemo sits outside of IDEs and works with all of them. No more hard to use, bulky editors to create/edit your presentation scripts. CodeDemo works with a plain text file. 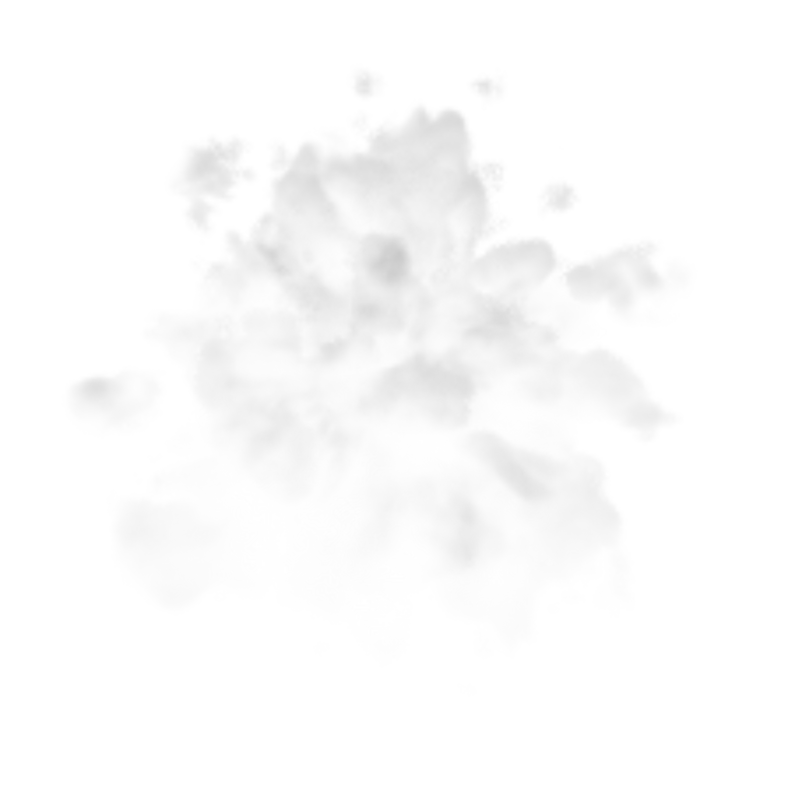 You can use your favorite text editor to create and edit this file. © Copyright 2013. ATSTAT LLC.